We settled this Miami car accident case for $325,000. Our client suffered a lower leg fracture. These are just a few of our many Florida car accident injury settlements. We have also had many Florida injury settlements. Since car crashes often involve other types of vehicles, check out our Florida truck accident settlements and Florida motorcycle accident settlements. All settlements on this page are before deduction for attorney’s fees and expenses. Most cases result in a lower recovery. It should not be assumed that your case will have as beneficial a result. After a lawsuit was filed for pedestrian who was hit by a car. He had multiple surgeries on his tibia (lower leg bone). I invite you to learn more about how much your case may be worth if you have a broken lower leg (tibia or fibula). Philadelphia Insurance Company paid $100,000 of this settlement. Ace Insurance Company was our client’s UM insurer. He purchased UM insurance when he rented his car. Ace paid $100,000 as well. We also sued the United States. They paid an additional $125,000. See a $300,000 settlement for a tibial plateau fracture from a car accident. The crash happened in Clearwater, Pinellas County, Florida. Travelers was the uninsured motorist insurer. They paid $200,000 to settle. Here is the settlement check. Allstate was the careless driver’s bodily injury liability insurer. As you can see, they paid $100,000 to settle. A vehicle crashed into an Uber car in Miami. The Uber driver claimed that the accident caused or aggravated his disc protrusions (herniated discs). I represented the Uber driver. The other driver’s insurance company paid me over $250,000 to settle the Uber driver’s personal injury claim. The other driver was at fault. Most of the settlement was for pain and suffering. The settlement also covered my client’s medical bills. Labrum (Shoulder) Tear which resulted in surgery for 57-year-old man who was in a truck accident. Travelers Insurance provided liability insurance coverage. Progressive was the uninsured motorist insurer. Our client was driving her car when she was hit (T-boned) by a car at an intersection. An ambulance took her to the hospital. She was diagnosed with a wrist fracture. She had surgery for her broken wrist. Doctors put a plate and screws in her non-dominant hand. She had back pain (bulging disc) and neck pain (2 herniated discs). The at-fault car was insured with USAA and Old Dominion Insurance (Main Street America Group). USAA paid $100K to settle. Old Dominion paid $100K to settle. The total settlement was for $200,000. A passenger had a back (lumbar) fusion surgery after another car hit him in Miami, Florida. On behalf of a passenger who had shoulder surgery from a car accident caused by an uninsured driver in Bonifay, Holmes County, Florida. My client made a claim against uninsured motorist (UM) insurance with Nationwide. Read more about this shoulder (rotator cuff) surgery settlement. Learn more about how much money a shoulder injury with surgery from an accident in Florida may be worth. A passenger got $135,000 after another car crashed into the car that she was in. The driver of the other car got a ticket for failure to yield the right of way. The accident caused our client’s wrist fracture and surgery. My client had a broken wrist with surgery from a car accident against a driver insured by GEICO in Miami. A car hit a pedestrian in Homestead, Miami-Dade County, Florida. She had fractures in face, resulting in surgery. Imperial Fire & Casualty Insurance (RAC partners) insured the driver. Keith was driving of a car in Coconut Grove, Miami-Dade County, Florida. Another car crashed into the back of the car that Keith was in. Here is a photo of the crash scene. The crash reported listed his injuries as possible. His airbag didn’t deploy. Keith was not transported to a hospital. About eight months after the crash, Keith had terrible lower back pain. His father ordered an MRI. 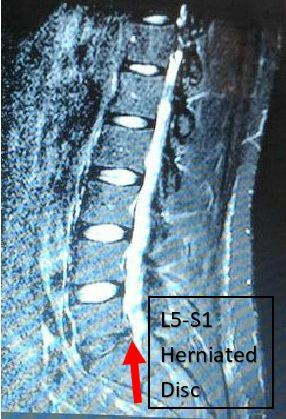 An MRI of his lumbar spine (lower back) showed a herniated disc at L5-S1. Here is the view of his herniated disc from the side. Below is another view of the herniated disc. This time the MRI is looking from top down. His dad referred him to a neurosurgeon. He had back surgery. Specifically, he had a L5-S1 hemilaminotomy, medial facetectomy and microdiskectomy, using a microsurgery. Here is an illustration of a discectomy. This is in the incision from the surgery. He was left with a scar on his lower back from the surgery. A scar on your lower back isn’t worth as much as a scar on a your face. Also, a scar on a man isn’t worth as much as the same scar on a woman. We sent State Farm a written request to give me certain insurance information required by Florida Statute 627.4137. State Farm insured the other driver. Eventually, without filing a lawsuit, State Farm offered the $100,000 bodily injury liability (BIL) limits. Here is the $100,000 settlement check. He was very happy with his settlement. A lady was driving her car in Broward County, Florida. A car crashed into her car. She claimed that the crash aggravated a pre-existing herniated disc. She also had a small fracture to a bone that didn’t need treatment. We represented the injured driver. See this $100,000 settlement for a motorcycle rider who was hit by a car. He claimed that that the crash caused or worsened his herniated disc, and meniscus tear. He claimed that the crash caused his erectile dysfunction (ED). A man was driving his car, heading straight. A 18 wheeler truck coming in the opposite direction made a left hand turn. The car crashed into the 18 wheeler. The driver of the car claimed that the car crash caused or aggravated his C5-C6 herniated disc. Zurich Insurance Company insured the tractor trailer. For a woman who had facial fractures when she was hit by a Ford F-150 truck while she was on or pushing her bicycle across an intersection. It happened in Cooper City, Broward County, Florida. The at fault party had $100,000 in BI liability coverage. She was airlifted to the hospital by Broward County Air Rescue. Unfortunately, as is too often, are client didn’t have uninsured motorist insurance which would have given her the opportunity to get many more thousands of dollars. This story made the Sun Sentinel newspaper as well as the Miami Herald. I contacted a representative of Memorial Regional Hospital in Hollywood, Florida. She reduced my client’s hospital bill after I sent a written request to reduce medical bills. My client ‘s son-in-law (resident relative) did not carry underinsured motorist (UIM) insurance on his car. Thus, his auto insurance company did not have to pay her any additional money for UIM benefits. A woman was driving her car in Homestead, Miami-Dade County, Florida. Another driver crashed into the back of her car. She had a bulging disc. A doctor gave her epidural steroid injections to her lower back. She had lower back surgery (a percutaneous discectomy). Liberty Mutual insured the truck driver with $100,000 in bodily injury liability (BIL) insurance. They claimed that the woman hit the car in front of her before the truck driver hit her car. Liberty Mutual put 50% blame – for causing the accident – on the woman. MGA Insurance Company insured the claimant’s car. The Property & Casualty Insurance company of Hartford paid $100,000 to a passenger in a one car collision. The driver of the car pressed the accelerator instead of the brake. She drove into a fixed object. The passenger had thumb surgery as well as pain in his knee, a head injury, neck pain and lower back pain. For a gentleman who was hit by a car that was “uninsured” for purposes of Florida law. Without an attorney, my client probably would not have known to file a civil remedy notice against the uninsured motorist insurance company. I believe that filing a civil remedy notice made them pay this claim as the money was rightfully owed. In fact the uninsured/underinsured motorist insurance company paid its settlement (insurance policy) limits after Mr. Ziegler filed a civil remedy notice and drafted a lawsuit against them. For a man who suffered a herniated disc after being hit by a drunk driver. Miami, Florida. Woman had arthroscopic knee surgery and a bulging disc as a result of a car making a left hand turn in front of her in Miami near Coconut Grove, Florida. Progressive was the bodily injury liability insurer for the other car. The other car was cited for failing to yield the right of way. Allstate was the underinsured motorist (UIM) auto insurer. Progressive paid $50,000 and Allstate paid $25,000. You can read more about this $75,000 settlement for knee surgery and bulging disc from a car accident in Miami. See a $70,000 settlement for a passenger who was in a Lyft car, when another car hit it. He claimed the crash caused neck, back, wrist and ankle injuries. See my case where a pedestrian was hit by a car while not in a crosswalk. We settled for $70,000 for her tibial plateau fracture, sacrum fracture, herniated discs and shoulder impingement. Learn about a $65,000 Settlement for a lady who had surgery on a full thickness rotator cuff tear after she was rear ended in a Orlando, Florida car crash. For a woman in her twenties who was involved in a multi car collision. Her injuries ultimately resulted in arthroscopic shoulder surgery to her non-dominant shoulder. The insurance companies for the responsible parties were GEICO and Progressive. The liability limits of bodily injury insurance for one of the at fault insurance companies was limited to $10,000. Her car sustained minor to moderate damage. Her shoulder healed well following surgery. An on-duty police officer was stopped in traffic, when another car rear ended him. The crash happened in Medley, Florida (North Miami-Dade County). The driver who caused the accident received a ticket for following too closely. State Farm insured the careless driver. State Farm Insurance paid us the careless driver’s $10,000 BI limits. The officer said that the wreck caused or aggravated his bulging disc. He had epidural shots to his lower back. The cop was a candidate for lower back surgery (lumbar laminectomy). He did not have surgery. Travelers Insurance insured the police officer on his personal car. (He wasn’t using his personal car when the accident happened). Workers compensation for the police department paid over $17,000 in indemnity (lost wages) and medical benefits. I settled the UIM case with Travelers for $47,000. Thus, State Farm and Travelers paid a combined $57,000 for the personal injury case. For a bicyclist who sustained a herniated disc and compression fracture after being hit by a driver of a car. On behalf of a 26-year-old man who was injured (while he was on a scooter/moped) when a NAPA van’s front end crashed into the moped. According to the police report, the driver of the van stopped and rendered aid but then fled the scene without giving any information. The driver of the van was later stopped. Miami-Dade Fire Rescue treated the driver of the moped on the scene. The driver of the van received a citation for failure to yield at intersection. See a $50,000 settlement where a motorcyclist was forced to lay his motorcycle down when a car turned into his direct path. He broke his collarbone. Travelers Insurance Company paid the settlement. Here is the settlement check. Settlement check with some info redacted. The accident happened in Land O Lakes, Pasco County, Florida. I represented the motorcycle rider. For my client, a man in his 30’s, who was diagnosed with a herniated disc in his lower back following an accident. The damage to his pickup truck is below. The crash happened in Pinecrest, Miami-Dade County, Florida. Before this crash, he received years of chiropractic treatment on the same levels in his lower back that he claimed were injured in this accident. He was given epidurals to his lower back after this accident. GEICO insured the negligent driver with bodily injury (BI) liability coverage. My client had uninsured motorist (UM) liability coverage with Star & Shield Casualty (NARS). North American Risk Services (NARS) handled the claim for Star & Shield. NARS paid $19,000 to settle the case. This is in addition to the $20,000 settlement with GEICO. The total settlement was $39,000. Settlement Date: March 2014. See a case where State Farm, Allstate and a car owner paid a passenger $37,500 for a broken wrist (distal radius fracture) with surgery. A scooter rider got $35,000 after a driver failed to yield the right of way and hit him in Miami Lakes, Florida. He suffered an upper leg (femur) fracture. United Auto Insurance Company (UAIC) paid $10,000. GEICO paid $25,000. A bike rider, sustained a meniscus tear and tibia plateau fracture, as a result of being hit by a car while he was riding his bike. He basically had no limitations following the healing of his injuries. Check out a $30,000 settlement after a driver was rear ended in Orlando, Florida. She claimed that the accident caused a meniscus tear in her knee. USAA insured the at fault driver. In October 2005, USAA paid $30,000 to settle the case. Tom, a 51 year old, was driving a box truck on I-75 in Wildwood, Sumter County, Florida. Jose was driving an 18 wheeler truck headed in the same direction. The front of Jose’s truck hit the back of Tom’s truck. American Inter-Fidelity Exchange insured Jose’s employer. We also claimed that the collision worsened the chondromalacia in his knee. An MRI of his knee is below. Chondromalacia patellae, also known as “runner’s knee,” is a condition where the cartilage on the undersurface of the patella (kneecap) deteriorates and softens. American Inter-Fidelity Exchange paid $28,000 to settle Tom’s injury claim. In a car accident for a passenger that was rear ended. He treated with chiropractors for over a year before having an MRI on his back. An MRI revealed a herniated disc effacing (pressing on) the spinal cord. My client lives in California and the accident occured before he was about to get on a cruise ship. We have settled three (3) other claims for his wife and kids who were in the car at the time of the car crash. This client is one of the numerous clients that we has represented that doesn’t live in Florida. Auto Club Insurance Company paid a passenger $25,000 to settle her soft tissue injury claim. The crash was in Hialeah, Miami-Dade County. This is a different passenger’s settlement arising from the same crash above. Auto Club Insurance Company paid another passenger $25,000 to settle his soft tissue injury claim. The accident was in Hialeah, Miami-Dade County. I represented him. Photo taken after the crash. My client claimed that a car crash caused his shoulder, wrist, back, knees, ankle and neck pain. Another driver was cited for careless driving. The careless driver was uninsured. My client had $25,000 in uninsured motorist (UM) coverage with USAA. The accident happened in Key Largo, Miami-Dade County, Florida. A drunk driver (insured by State Farm) crashed into a car within which our client, a young lady, was a passenger. Our client’s injuries were neck, back and leg pain. We settled for the bodily injury liability coverage limits of $25,000. Location of Accident: Miami, Florida. Date of Settlement: January, 2014. For a young woman who was a passenger in a car that slammed into the car in front of it. Her injuries were cervical, thoracic and lumbosacral spine chronic sprain/strain injuries. Another personal injury that she suffered was a C6-C7 posterior disc herniation and Bilateral broad-based bulging discs C3-C4, C4-C5. She also had Bilateral feet and toes paresthesia. The policy limits for the driver insured by State Farm were $25,000. My client did not have underinsured motorist insurance which would have resulted in a much larger payout for my client. For an elderly Cuban-American businessman who suffered a broken (fractured) tibia (lower leg bone) when he was hit by a driver insured by State Farm Insurance Company. The accident occured in Hialeah, Florida. My client did not purchase undersinsured motorist insurance coverage which would have resulted in a larger payout for my client. For a driver (insured by USAA) in Miami, Florida who had soft tissue injuries as a result of being rear ended by a truck. See a $20,000 settlement where a driver claimed that a car made an improper lane change and crashed into her SUV. She claimed a herniated disc, ACL sprain/tear and more. See a case where a driver got $20,000 after a truck hit him. He claimed a concussion, injury to his shoulder, spine & loss of sensation to his fingertip. Lisa (not real name) was in a car that was T-boned by another car at an intersection in Miami-Dade County, Florida. We claimed that the accident caused or aggravated a herniated disc in her lower back. She also claimed that the crash caused a small scar on her body. Infinity Indemnity Insurance Company insured the other driver. Infinity paid the $10,000 bodily injury (“BI”) liability insurance limits. Another insurance company paid its $10,000 UIM insurance limits. Henry (not real name) was in a car that was T-boned by another car at an intersection in Miami-Dade County, Florida. We claimed that the accident caused or aggravated a herniated disc in her lower back. Infinity Indemnity Insurance Company insured the other driver. Infinity Indemnity Insurance Company paid the BI liability insurance $10,000 limits. Another insurance company paid its $10,000 UIM insurance limits. We represented Henry. My client was driving a car when another driver hit her. She had neck pain. The accident happened in Palmetto Bay, Florida. For a Venezuelan woman who was rear ended by another driver. Progressive insured the careless driver, who was cited for reckless driving. Our client, a mother and wife, received chiropractic care for her personal injury. An MRI of her neck revealed a disc protrusion (herniation) which indented on the ventral (spinal) cord. She also had multilevel disc bulges. The chiropractor stated that she should meet with an orthopedic doctor to discuss having surgery. For a bicyclist who sustained lacerations to her chin and required several staples in her abdomen when a driver (insured by State Farm) hit her. The police officer did not issue a ticket because he felt that my client, the bike rider, and the other driver were at fault. My client was on her bike riding against the flow of traffic. The insurance company stated that they believed the bicycle rider was responsible for 30% of the accident. My client was driving his pickup truck. A driver failed to yield the right of way. He hit my client. It happened in Miami-Dade County, Florida. GEICO insured the careless driver. My client was diagnosed with a herniated disc in his back. GEICO settled the case for $16,500. For a woman who was hit by a drunk driver insured by Progressive Insurance. She had back pain and neck pain and treated with a family doctor and rehab facility. She did not have an MRI done. Miami, Florida. For a passenger (neck and back pain) hit by a drunk driver insured by Progressive Auto Insurance. Miami, Florida. On behalf of a woman who was rear ended by another car. We received the policy limits of $10,000 from Allstate. State Farm, her underinsured motorist carrier, paid $2,500. For a mother of three who suffered personal injury to her shoulder and neck when she was broadsided by another car in Miami, Florida. The at fault driver is insured by Progressive. My client was taken by ambulance to the Emergency Room, where she was released after a several hours. The SUV which she was driving was a total loss. Immediately following the accident, she had excruciating neck and shoulder pain, and later had an MRI which revealed a herniated disc in her lower back. Her daughter also suffered personal injury in the same car accident. A pedestrian, Marlene, was walking in a crosswalk in Little Havana, Miami-Dade County, Florida. A driver of a car hit her. An ambulance took her from the accident scene to the hospital. She was diagnosed with a fracture of the shoulder and thumb. She was smart in hiring us shortly after the accident. It allowed us to preserve evidence in her case. Here is a photo of her with a sling for her shoulder injury. Specifically, her shoulder fracture was an impacted comminuted fracture of the humeral neck. There was displacement of the greater tuberosity. Her finger fractures were nondisplaced transverse fractures of the proximal metaphysis of the proximal and distal phalanges of the thumb. She was very happy with her portion of the settlement. After my attorney’s fees, she received almost the entire settlement. Most of the settlement was for pain and suffering. Unfortunately, the at fault driver wasn’t driving for Uber or Lyft, which would have given him more insurance coverage. Our client didn’t own a car or live with relatives. Thus, she wasn’t entitled to uninsured motorist insurance. A pedestrian was walking in a crosswalk in Little Havana, Miami-Dade County, Florida. A driver of a car hit him. An ambulance took him from the accident scene to the hospital. He was diagnosed with a head injury. He had stitches to his head. United Auto Insurance Company insured the at fault driver with a $10,000 BIL insurance policy. United Auto paid us the $10,000 BIL limits to settle his personal injury claim. Unfortunately, the driver wasn’t driving for Uber or Lyft that would have given him more insurance coverage. Our client didn’t own a car or live with relatives. Thus, he wasn’t entitled to uninsured motorist insurance. Allstate paid $10,000 after a driver ran over a pedestrian’s foot. He claimed a soft tissue foot and ankle injury. The accident happened in Miami Beach, Florida. We represented the pedestrian. See a case where GEICO paid a driver $10,000 for her nose injury after a careless driver rear ended her on the Palmetto Expressway in Miami. $10,000 Settlement for meniscus tear from Miami Beach car accident. Learn about our client’s $10,000 settlement after a car rear ended him in Miami Beach, Florida. He had surgery to fix his torn meniscus (in the knee). We settled this case in July 2015. Infinity Auto Insurance insured our client with PIP. Infinity is a below average Florida BI insurer. Allstate insured the careless driver. Our client was driving a car in Miami, Florida. Another driver t-boned him. My client had shoulder pain. He claimed a clavicle fracture. Star Casualty Insurance Company insured the other driver. They paid the BI liability limits of $10,000. Read more about it here. For personal injury victim who injured his back and neck in a rear end car accident. GEICO insured the car whose driver received a ticket for careless driving. For a Michigan woman who was injured while driving her car in Florida. She treated at the hospital and then with a chiropractor for several months. Her injuries were soft tissue. The driver who was at fault was insured with GEICO. For a Cuban-American 30-year-old who was rear ended (while stopped in the emergency lane) on I-95 by a driver insured by State Farm Insurance. My client’s injuries included back pain and a serious eye injury. He was treated at the Anne Bates Leach eye center, Jackson Memorial Hospital, and Bascon Palmer in Miami, Florida. Unfortunately, the driver and owner of the car that rear ended my client were underinsured. My client did not have underinsured motorist insurance which would have resulted in a much larger payout for my client. Lady claimed soft tissue injuries after she was driving her, which was hit by another car in Venice, Lee County, Florida. The at fault driver had bodily injury insurance through American International Group (AIG). Her hands were burned by her car’s airbag. The burns went after a few months. My client, a woman, was driving her car. A driver failed to yield the right of way to incoming traffic and struck her. Zurich Insurance Company handled the claim for the at fault driver. My client had soft tissue injuries. Empire Fire and Marine Insurance Company issued the at fault driver’s insurance policy. A young woman who was a passenger in a car. The car was stopped in the street in Little Havana, Florida. Another driver crashed into her car. A pole fell on the car that she was in. Both drivers were killed. The insurance company that insured the host vehicle has been bought by Kingsway Amigo. Ocean Harbor insured the careless driver. However, his policy didn’t have BI liability insurance. Our client had soft tissue injuries. The host vehicle’s insurer paid the $10,000 policy limits to settle the case. The car that our client was in did not have uninsured motorist (UM) insurance. If it had UM insurance, she would have received a bigger settlement to cover her pain and suffering as well as emotional distress. A driver rear ended another driver (our client) on I-395. Our client developed headaches immediately. She also began experiencing severe neck pain the following day. She had an MRI of her neck. The report stated that she had a disk herniation in her neck (cervical spine). First Commercial insured the at fault driver. A careless driver crashed into the rear of my client’s car in Homestead, Florida. My client treated with a chiropractor for several weeks. His injuries included a neck sprain. He also had a consultation with an orthopedic doctor. Metropolitan Life (Metlife) insured the careless driver who caused the crash. A careless driver crashed into the rear of my client’s car. It happened in Homestead, Florida. My client treated with a chiropractor for several weeks. Her injuries included a neck sprain. For our client, a driver, who was injured. A hit and run driver hit his car and fled the scene. Our client’s first medical appointment was about seven days after the crash. He was diagnosed with a Cervical sprain-strain, Thoracic sprain-strain and Lumbar sprain-strain. About 1 month later, he had an MRI of the cervical spine. It showed a C5-C6 paracentral disk protrusion, moderate in size, compressing upon the thecal sac. He treated for four months from the date of the accident. At the end of his treatment, the diagnosis was a lumbar strain. I argued to the insurance company that punitive damages would be awarded since the negligent driver fled the accident scene. An injured victim may be able to get punitive damages if the car that hits him or her leaves the accident scene. The careless driver was insured with Metlife. Young child who suffered personal injury soft tissue injuries while she was a passenger in her mother’s car, which was hit by another car in Venice, Lee County, Florida. Venice is near Fort Myers. She was taken via ambulance to the Emergency Room. She had a follow-up visit with her pediatric doctor. AIG insured the at fault driver with bodily injury (BI) liability coverage. This is one of my many Florida child injury settlements. Below are a couple of Florida car accident settlements that are not mine. Actual Case (not my case): $16.5 Million for pain and suffering was affirmed (approved) by the 4th District Court of Appeal (Broward and Palm Beach County) for a 20 year old man who was rendered paraplegic after he was hit by a motor vehicle while he was on a motorcycle. $11.5 Million of the award was for future pain and suffering. $5 Million was for past pain and suffering. The accident was in 2006. The total verdict was for 18,888,875 and it was in 2012. The case is Vanzyl vs. Fain and Kincaid. My thoughts: I assume that the Plaintiff argued that he is going to live until age 78 or so, which would be another 58 years. That means that the 4th district appeals court approved the jury’s award of approximately $198,275 a year for future pain and suffering. The court also approved the award of roughly a $1 Million a year for past pain and suffering. Actual case (not mine): $300,000 verdict for pain and suffering alone for a 46-year-old woman who had surgery in her lower back after she was hit by a Walgreen’s tractor trailer truck in Palm Beach County, Florida. She claimed a herniated disc and an annular tear after she was hit (t-boned) by a Walgreen’s truck. The verdict was in 2004. The case is Anderson v. Walgreens. You can learn more about this case and Walgreens injury settlements. Check out some truck accident settlements in Florida. Over 87 Important factors may affect the settlement value of a Florida injury case. Over 87 important factors may affect the settlement value of a Florida injury case. Most people only know a couple of these factors. There are also over 15 factors that specifically affect whether you have a Florida car accident case. Who are some other major Florida auto insurers not mentioned above? Check out some of the many Florida injury cases that we have settled, including but not limited to car accidents, truck accidents, motorcycle accidents, bike accidents, pedestrian accidents, taxi accidents, drunk driving (DUI) accidents and much more. Our Miami law firm represents people injured anywhere in Florida in car accidents, truck accidents, slip, trip and falls, motorcycle accidents, bike accidents, drunk driving crashes, pedestrian accidents, taxi accidents, accidents involving an Uber or Lyft Driver, and many other types of accidents.